Yesterday my son mentioned the Toy Eater. he's usually quoting a poem. 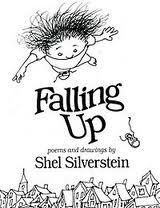 Many kids adore the nonsense of Shel Silverstein. It strikes an amazingly strong chord with my son. I don't remember Falling Up, but my son does. that uses numbers as words. Was what that monkey 8 . . ."
a recent picture book based on that idea. and rhyme, depending on your time. *Just the time to write about them.